You should have this pair of Rocky Lynx Waterproof Snake Boots on your feet. The upper is made with 16” of genuine Cordura® fabric that is covered in a MOBU (Mossy Oak Break-Up®) camo print. This nylon fabric is rugged enough to be able to withstand tough conditions but it’s also lightweight. 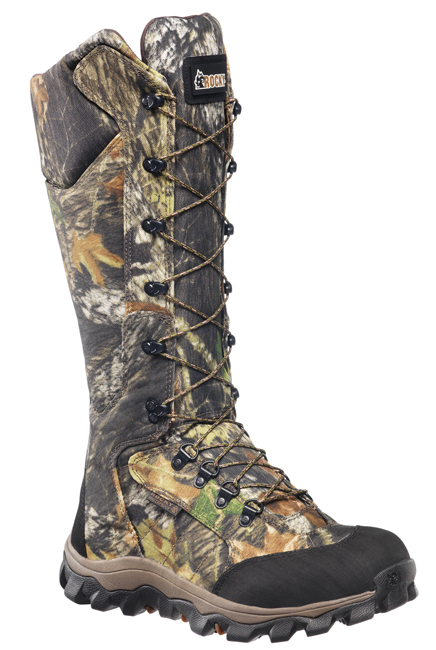 On both the toe and heel, this Rocky Lynx boot offers abrasion protection. When you’re walking in water that has risen above your ankles, you will take comfort in knowing that the Rocky waterproof construction is going to keep your legs and feet dry. The snake proof fabric is useful when it comes to protecting your feet from getting bitten by one of the most hazardous snakes in North America. Since these Rocky Lynx boots are meant to be laced up, you are able to adjust the fit to your liking. You may view this Lynx snake boot and wonder if it will be difficult to put on and take off. This will not be an issue with this particular Lynx boot, because it has a side-zipper (inside the boot) that allows you to get the boots on and take them off easily. You will receive cushioning from the Terra Suspension polyurethane (PU) footbed.This footbed also absorbs shock. Then there is the EVA midsole that is impact-absorbing, compression molded, and is extremely durable. The rubber Lynx outsole is great for all-terrain. You will not have to struggle to be able to move quickly in these boots. Order your pair today!